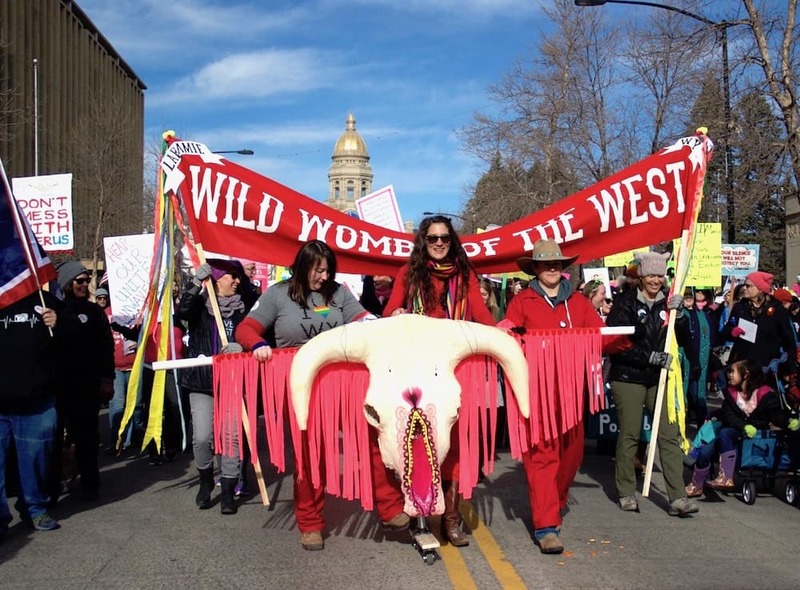 Wyoming women march in Cheyenne on Jan. 21, 2017 to protest policies harmful to women. Some opponents of pending House legislation contend the measure threatens basic protest rights. Last year we witnessed one of the strangest legislative battles Wyoming has ever seen, the fight over SF74 – Crimes against critical infrastructure. Last year’s bill not only sparked the ire of Native Americans and nonprofit groups around Wyoming who believed it would chill free speech, but also from ranchers who felt it gave energy companies more leverage to wield against landowners in property disputes. Notably, the legislation heavily favored energy industry infrastructure as opposed to agricultural infrastructure. The bill created new penalties for impeding and trespass upon critical infrastructure, duplicating laws already on the books. Unfortunately, a new version of the bill has reared its multi-pronged head this legislative session in the form of HB10 – Crimes against critical infrastructure. The legislation is not unique to Wyoming; it was imported from the American Legislative Exchange Council (ALEC), a think-tank that supports legislation favoring energy corporations around the nation. This cookie-cutter legislation popped up in a number of states over the last couple of years where proposed oil and gas pipelines are prevalent. Last session, SF74 was nicknamed the “zombie bill” because it just wouldn’t stay dead, even after being killed on a tie vote in the House Minerals Committee. The committee chair brought the bill back to life in a rare move by recalling the committee to revote on the bill. Two legislators conveniently flipped their votes. That questionable political intrigue then sparked hot debate and dozens of amendments in the House. The bill language became so convoluted that no one really understood what the bill did. It squeaked through the House, and at the last minute of the session the Senate hastily concurred, many admitting they did not know what the amended bill really did. In the end, Gov. Matt Mead thankfully vetoed the bill because it was poorly written and would have had unintended consequences. A subsequent attempt to override the veto failed, but this unnecessary legislation consumed valuable time and energy. Last March, when the Legislative Management Council rejected crimes against critical infrastructure as an interim legislative topic, we thought that was the end of this bad legislation. But that didn’t stop the sponsors of the original bill from putting a little lipstick on the pig and calling it HB10. The bill’s proponents purport to have worked out the bugs from last year, but it doesn’t change the fact that this is duplicative, unnecessary legislation that threatens our most basic constitutional rights and seeks to protect the energy industry and big corporations above all else. This is not the Wyoming way. House Bill 10 still threatens high fines and felony penalties and now contains sneaky language that really shows what the bill is about: economic loss. The bill states that an act of impeding critical infrastructure that causes damage of less than $1,000 is a misdemeanor, and if damage is more than $1,000, it’s a felony charge. A felony is punishable by up to a $10,000 fine and 10 years in prison. The bill also holds any organization responsible for the actions of its members and fines organizations $100,000 when members cause damage. What organization can control actions of individual members? For all the lip-service paid to protecting critical infrastructure, the bill does nothing to address the most significant threat — cyber-attacks. Hackers working at the behest of foreign governments or terrorist groups present the most real threat in the 21st century. If we were really worried about our critical infrastructure being shut down, we would address this issue, not just smooth the way for energy companies to roll over landowners, Native Americans and grassroots groups. We have existing trespass and vandalism laws; this bill does not enhance them. House Bill 10 duplicates what we have with unnecessary language and caters to the powerful energy corporations at our expense. Please call your legislator. Let’s kill the bill and avoid another legislative circus. Joyce Evans and Liza Millett are Wyoming landowners who have been involved with ranching for years. Both testified against SF74 before the House Minerals Committee during the 2018 session. Both are members of the Powder River Basin Resource Council. Resurrection of this ridiculous and unnecessary bill is just another example of how much Wyoming legislators are in thrall to extractive industries (with a senate whose president is in that business). Time for them to get over it and stop squalling like spoiled brats. This is the 21st Century, not the early 20th. Anthropogenic global warming is REAL. Legislators have real work to do … and by real work, I do NOT mean addressing ridiculous non-issues like Daylight Savings Time. I am really sorry to see this awful bill re-emerge. You did a good job of summarizing most of its weak points. Two others about last year’s bill still bother me. First the bill had a whole bunch of vague, wishy washy language that energy companies could use as the basis for bringing frivolous lawsuits against grassroots organizations and individuals. So without specified grounds a corporation could cause huge financial burdens on individuals in the form of defending themselves against lawsuits with or without merit. The second was that all of the authority to determine whether trespass had taken place was given to employees of energy companies. The assumption was that everyone who works for those companies is reliable and truthful while anyone trying to protect the earth is dishonest and wrong. The bill is an infringement on free speech at a time when scientists tell us it is more urgent than ever to work at stopping climate change. The state should not try to stop people from making that case. I hope the bill will die a permanent death this year.